Hey guys, get ready for podcast 204! In this podcast we are joined by a few guests and cover things like... Aggressive Caroling, everything that we saw at the VGA's, Virgins, and a ton more... It's great!Â Click for the audio! 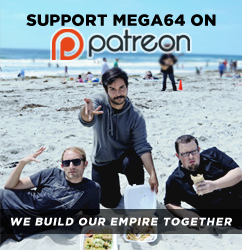 So...I personally think that Garrett has WAY tOo much time on his hands lately, so why not go check out our Mega64 Store and give him something to do. We also have a new video that should be coming out soon, so keep checking back! C U THEN!!! !